The River Restoration Centre (RRC) is able to support and provide advice to practitioners in a variety of different ways. While these are intended to show some of the ways we can help, we have a very flexible approach and it is often easier to talk to us directly to find out how we can help. Monitoring and evidence gathering has often played second fiddle to the design and construction of restoration. However, forward thinking practitioners are now increasingly making provisions in project budgets for better evaluation. RRC is able to either coordinate this on behalf of the project partners or provide independent advisory support. Also see the RRC’s monitoring guidance here. RRC was asked to lead and coordinate the monitoring programme for a river restoration project set in Mayes brook Park in 2011. We were contacted prior to on-the-ground works to identify what pre-data were available and therefore what baseline data should be collected. The RRC acted as a hub for the project, storing monitoring data collected in one accessible place. The RRC also liaised with relevant statutory agency staff and local practitioners to ensure that data were collected using the standardised methods at appropriate times of the year. The RRC kept all project partners up-to-date with what was going on by sending quarterly reports on the progress of the monitoring programme. RRC’s monitoring guidance provides advice and step-by-step guidance to setting up a monitoring programme for your restoration project. To draw on the RRC’s experience and expertise, ask us to act as an independent reviewer. We can assess your project against your monitoring targets and provide a simple monitoring framework table to help you get started. From 2012, the RRC has been the independent expert adviser of all 42 Catchment Restoration Fund projects across England. 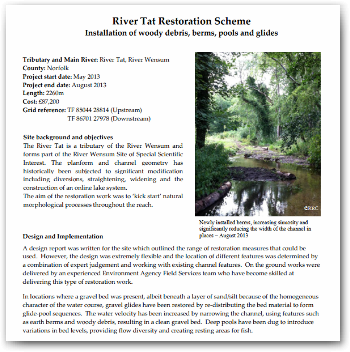 The Wandle Trust (Lead for 2 of these projects) used the RRC’s monitoring guidance to set S.M.A.R.T. monitoring objectives, they also asked RRC to provide an independent review of these at the onset of the project. The RRC identified a few cases where clarification was needed or more appropriate equipment was available to capture data that the Trust wanted to collect. This was a useful exercise to plan ahead what resources the Trust needed and when to set this aside for monitoring. RRC is able to provide an external and impartial perspective on your project’s achievements. Our reports and feedback may help you when trying to source funding for further restoration given our close ties with UK statutory organisations and our reputation as the UK's restoration advice and information centre. 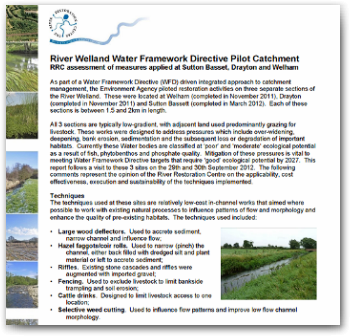 RRC was invited to visit three restored sites on the River Welland to assess measures implemented with the aim that these would lead to an improvement in the Water Framework Directive status of the waterbody. Comments were provided by RRC on the applicability, cost effectiveness, execution and sustainability of the techniques used. RRC can disseminate your project to a very wide audience by featuring it in our monthly Bulletin or on the website. We can also share your latest news using social media via Twitter, Facebook or YouTube. Simply make us aware of your work and we’ll do the rest. 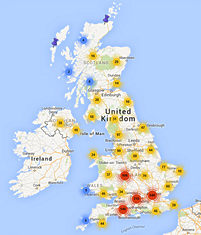 By visiting your site with you, we can also write up a case study or upload your efforts onto the fastest growing inventory of river restoration case studies, the European EU RiverWiki, and include the project on the RRC's UK Projects Map. RRC visited three restored sites on the River Wensum (including one on a tributary, the River Tat) and produced a series of case studies which reviewed the site background and objectives; project design and implementation; and subsequent performance from the RRC’s impartial and independent viewpoint. These featured in our monthly Bulletin in November 2013 and were later added to the RiverWiki in 2014.